Find phlebotomy training classes in Oklahoma below! Location: 4500 W. Lee Blvd. A phlebotomist’s job is to collect blood specimens from patients and distribute the specimens to different laboratory departments. The Rose State College in Oklahoma is one of the many schools that offers phlebotomy certification to aspiring students who want to work in this field. The Rose State College offers a two-semester certificate program. The program starts from the 1st of February to 15th of April for the fall semester and from the 1st of September to the 15th of November for the spring semester. The school only accepts a maximum of 15 students for each semester and are required to maintain a grade of C or better in each course of completion in order to receive the certificate. The students need to complete a total of 24 units with two core requirements and several certificate electives. Students are eligible to take the national board exams as soon as they complete the program. The Moore Norman Technology Center located in 4701 12th Avenue NW in Oklahoma offers courses for aspiring phlebotomy technicians. The students are taught the different techniques of venipuncture based on established clinical procedures. Moreover, students are also taught the ethical issues related to this discipline. Students are taught both classroom and hands-on instruction wherein they need to complete a total of 48 hours each for both classroom and clinical training hours. Students who wish to enroll in Moore Norman Technology Center need to pass a background check and should be able to pass the color blind test for them to be admitted to the school. Also, students who apply for this program should be 18 years old and above. Enrolling in the Moore Normal Technology Center will provide aspiring phlebotomists the knowledge that they need to be able to become efficient licensed clinical workers. Seminole State College in 2701 Boren Boulevard in Oklahoma City offers a Phlebotomy Certificate Course once a year from the start of May and continues until June. The course is open only to a maximum of 10 students. Students are required to take 3 credit hour courses which include lectures, laboratory sessions, and clinical practicum. Both lecture and lab sessions are completed in the campus during a two-week session. Students need 16 lecture hours, 32 laboratory hours and 100 hours of clinical practicum with 100 successful phlebotomy procedures. While enrolled in the course, the students are expected to learn phlebotomy skills which they can use to develop their practical skills. Students are required to get a grade of C or better before they can continue with the clinical practicum. If the student can complete all of the three components of the course (lecture, laboratory and clinical practicum), they are allowed to get the Certificate of Achievement or the Certification PBT Exam. 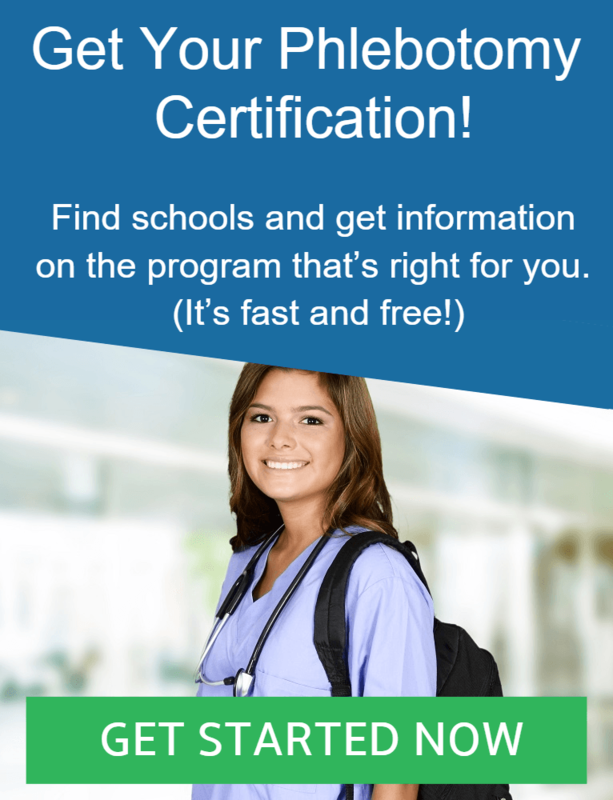 There are many schools where you can study and get your phlebotomy certificate in Oklahoma and one of the best places is the Tulsa Community College. Tulsa Community College offers a phlebotomy certificate program that is accredited by the National Accrediting Agency for Clinical Laboratory Sciences. Aspirants who want to study phlebotomy need to submit their GED or high school diploma as well as join the phlebotomy orientation. Fortunately, there is no minimum score for admission into this program thus the school imposes a first come, first serve basis. The phlebotomy certificate program of Tulsa Community College admits only admits 12 students for each semester. However, multiple sections may also be available based on demand. Students need to complete the program within one semester. Once the program has been completed, students can then take the certification program in order to become certified and licensed phlebotomists.